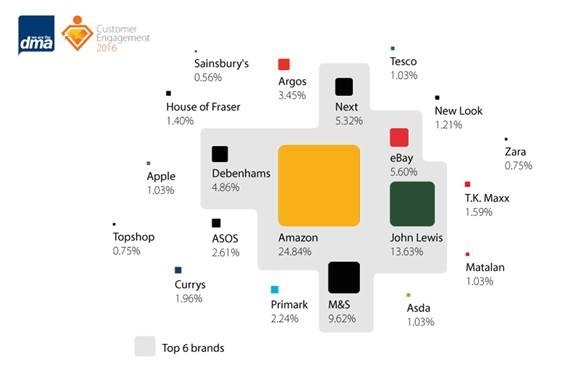 Over a quarter of UK shoppers say that online giant Amazon is their favourite retailer, with John Lewis (14%) and M&S (10%) following behind, accoding to new research. The findings, from the Direct Marketing Association, looked into the relationships that customers have with retail brands revealing that Amazon is named as the favourite for one in four (25%) of consumers surveyed. While Amazon topped the list, just three of the top 20 are online-only – Amazon, eBay and ASOS. However, most of these have also experimented with in-store experiences over the last 12 months, highlighting the continued importance of a multi-channel strategy when it comes to retail customer engagement. Most notably, Apple came in 14th behind traditional high street brands including John Lewis, M&S, Next, Debenhams, Primark and House of Fraser. Conducted as part of the DMA’s Customer Engagement research, the survey asked 1,000 consumers to name their favourite retail brand. Respondents were not offered a shortlist of options, but rather offered an open and unprompted text-box to write their favourite retails brands. The research also found that most consumers fall into one of three types of brand loyalty, with 40% being actively loyal, 28% actively disloyal and the loyalty of the remaining consumers depending on the context. In addition, 24% of those surveyed currently take part in loyalty schemes, with almost half (46%) of respondents not in loyalty schemes, but would like to in the future. More than three-quarters (77%) of consumers were interested in joining a loyalty scheme after buying a product. Tomas Salfischberger, CEO at Relay42, added, “Along with a few online giants, customer loyalties notably lie with those brands who connect bricks with clicks. This research means that now, a siloed approach must move into omnichannel approach, connecting all consumer data-sources, so that brands are able to incentivise and deliver on customer loyalty – no matter what the context.